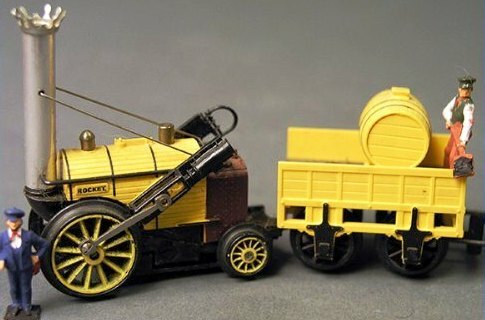 This early steam loco and passenger car was built for American Train & Track in England by Hornby. 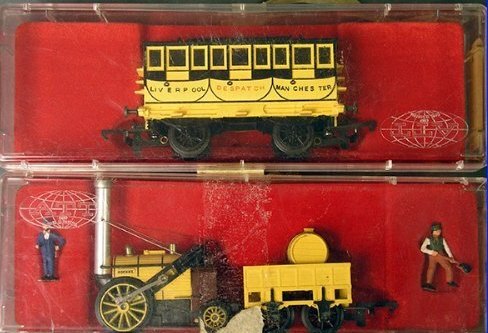 Origin marks on the bottom of the engine and cars states Hornby based on examples examined. Below are boxed examples of this unique model in clear plastic ATT cases. Models delivered in this interesting packaging included a clear lid and box with a foam insert that the model rested upon. The ATT globe logo may be found in the lid corner. A 1968 ATT ad shows a $24.98 price for the Stephenson's Rocket set, which included the loco, three coaches, and a circle of Atlas track and power pack.